2017 Washington DC’s Premier Canna-Bition Event Hosts, Kia Jackson, CEO of WOMMAN LLC. and DC Scroger Present WICKED THURSDAYZ! 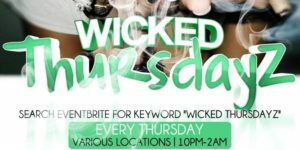 Every Thursday come get really WICKED with ear candy for those born before 1990 from DJ Mike Phillips; infused cuisine from the Anonymous Canna Chef; non-infused jallof rice and wings from Chef Prince, all of the TOP QUALITY canna products on the East Coast from Dr. Trichome; live body painting by Nubian Astethics with the Queen Kemoni Bell, and consumption consultation with the most committed to the plant King, DC Scroger! Giveaways and treats when you walk in the door! Complimentary! Moet Rose bottle specials! !